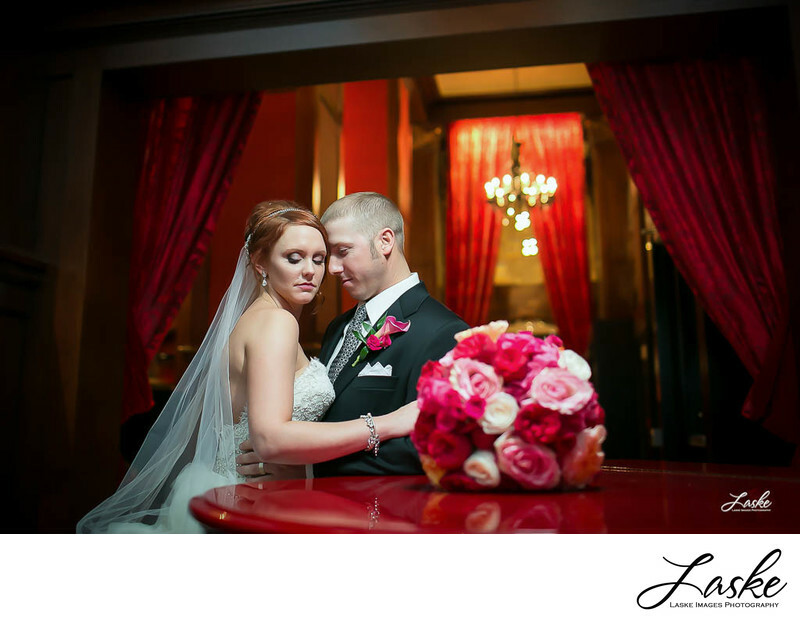 This wedding portrait taken at the Skirvin Hilton Hotel in Oklahoma City, was in an intimate setting and creatively executed by our team member, Amanda Becker. Our photographers that were there for this couple, worked together to turn this rather dark part lobby into a well-lite colorful location for this bride and groom. The rich red tones from the piano to the curtains complimented them. How much time will you need for wedding portraits on your Big Day? Ideally, wedding portraits for any couple getting married should be around 30 minutes to do just for the intimate formal shots of the celebrated couple, however, due to unforeseen circumstances, you may have less time. And that is OK! Some venues may have rather dark conditions and it is always best that the photographer is prepared with lighting, creative thinking with a quick and effective execution. Each and every wedding couple we have had the pleasure of providing coverage for, had their own unique style, emotion, and color choices that best suited them, and you will, too! For this bridal couple, the team used the location with the time they had to help create an portrait that told a story. Even if we have only a few minutes to 30 minutes, we will find and advise the best location in the venue you select that works with you! With wedding portraits, it is a great idea to discuss these details with your photographer (s). We deliver the best bridal portraits you have grown to expect from our brand. What do you want your wedding images to say about the story of your day? Contact us for your consultation!